the patchwork tops above will be part of the november shop update (date to be confirmed in the next week. i'm a bit behind due to crazy illness and my wool stuffing being packed away somewhere in storage), made into baby blankets backed with organic hemp/cotton fleece. that's as close to quilting as i'm getting these days and that's enough for now. 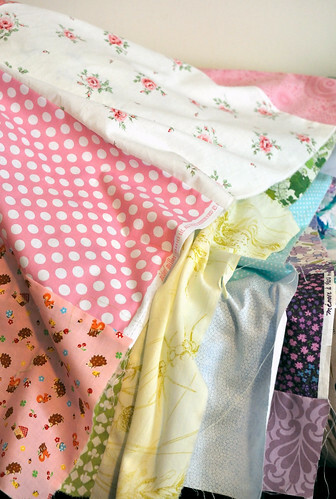 Leslie, these fabrics are so sweet and perfect for summer. Where did you get that lovely little rose fabric? thanks, rosie! it was a vintage pillowcase - sweet, hey? i was actually just looking at the tiny piece i have left today and wishing i had enough to make mae a shirt with it - she is turning into SUCH a girly girl. Your work is simply beautiful! I remember embracing all things girly at that age! It's best to focus on the kids... you'll get back to the custom stuff one day!